A client in the automotive industry asked MJ Engineering to develop a faster, more reliable method of inspecting its coated battery rods to eliminate human error and increase quality control. Each year, the client makes roughly 750,000 of the battery rods. The client’s former inspection process involved humans manually checking the rods for defects. The process was time-consuming, did not enable every battery rod to be inspected, and left the determination of part quality up to human judgment. To solve that dilemma, MJ Engineering created an automated system that can quickly inspect 100% of the battery rods to ensure they meet the required specifications for height, form, and thread quality. The rods that do not meet the specifications are automatically routed to a reject bin. 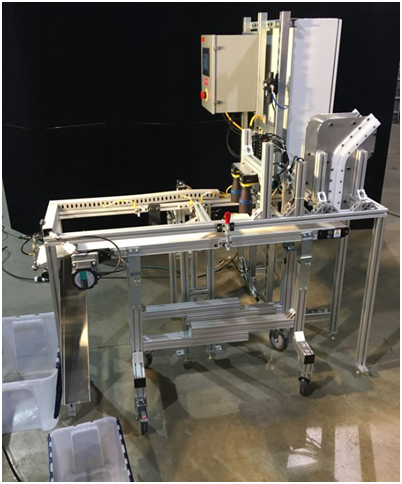 MJ Engineering’s automated battery rod inspection system can inspect nine different features per battery rod at a rate of one every six seconds. The rods are loaded into a gravity-fed part feeder. A backlight conveyor belt moves the rods through the system. A dimensional height check is performed by a linear variable differential transformer (LVDT), and the part is aligned. Two high-resolution Cognex cameras take measurements to check the rod’s form. A New Vista thread verification system spins a die on and off the rod’s threads to make sure they are free of excess coating or burrs and to verify thread length and tapping. The rods that meet the required criteria are dropped into a “good” bin at the end of the conveyor. The operator controls the system from an electrical enclosure, using a human machine interface. Various pieces of the inspection process can be turned on or off at any time, and the conveyor can be removed for easy belt replacement. To learn more about our engineering and design services, please contact MJ Engineering. For more details about this specific project, refer to the following information. MJ Engineering designed and developed a machine that identifies and resolves the quality control issues of a particular part for an automotive supplier, while saving the company time and resources and reducing scrap.